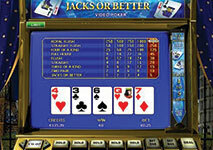 Video poker is one of the few casino games that give players the chance to win by using their skills and knowledge. Throughout the years, a number of strategies have been developed in an attempt to improve the odds of the game and make it more favourable for the players. Experienced video poker players know that they need to employ a proper strategy in order to win in the long term. Undoubtedly, one of the most important strategies that every poker enthusiast needs to know is the basic strategy. This is the first step towards becoming a proficient video poker player. Many inexperienced gamblers often rely solely on luck, which in games such as video poker, is not the best decision since it is possible to influence their outcome by having appropriate knowledge. 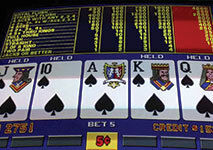 The truth is that players can enjoy video poker the most, only if they follow a strategy. The chance to win the game by using the relevant skills is one of the things that make it so interesting and exciting. Not to mention the fact that thanks to the basic strategy, players can gain advantage and win some cash which is a valuable opportunity which not many casino games offer. Moreover, once players have mastered the basic strategy, they can improve their game even more by learning the advanced strategy. The basic strategy is one of the most used strategies when it comes to video poker. It works very well as it has proven to be highly efficient and reliable. It is perfect for even inexperienced players as it is very simple and easy to use. Nowadays, it is extremely accessible to learn the basic strategy as there are many available charts on the Internet. In brief, this strategy suggests the best moves players can make, depending on the hand they have. It uses basic rules and principles which makes it easy to grasp. It is also worth mentioning that the basic strategy chart varies, depending on the variation of video poker. The most important decision that every player needs to make while playing video poker, is to decide which card to hold and which one to replace. The basic strategy serves as a guide as it suggests which move is the best in a particular situation. Regardless of the variation that players have chosen to play, at the beginning of each round, they will be dealt five cards. It is possible to replace all of the five cards or none of them and it is entirely up to the players to make this decision. Without an appropriate strategy, it can be really hard to decide as the possible card combinations that can be formed are a lot. Unless players are dealt the best hand – Royal Flush, they should always discard at least one card. This rule inevitably gives rise to the question which cards are supposed to be replaced and which ones should be held. This is where the basic strategy comes into effect. In order to clarify this matter further, let’s have a look at some of the fundamental things which players should remember. First of all, there are certain cards or combinations of cards that players should always keep in their hand. One of the major rules of the basic strategy is that it is always good to keep winning cards. In most games, these cards are usually a pair of jacks or better, although, in certain variations, they can be as low as a pair of tens. There is no obvious reason to discard such strong cards as they are highly beneficial. There are a few rare occasions that it might be acceptable to replace a winning pair. For instance, if players have 4 or 5 cards that contribute to a Royal Flush. In such cases, it is a good idea to discard the card that does not belong to the combination and go for a Flush. The odds are against players and in most cases, they will lose. However, the risk might be worth taking as in case they get lucky they can win big. Secondly, in most cases players should hold high cards. Four of a Kind, Straight Flush, Full House, Royal Flush, Pair of Two are among the card combinations which should be always held. In case that players hold Three of a Kind, they should replace the two remaining cards. If they are dealt a hand with no winning combinations or pairs, it is best to keep whatever high cards they have. Usually, face cards are considered to be high value ones. The reason why players should always keep high cards is that this way, they have a 1/13 chance of getting a matching card and an even better chance of getting a winning hand. However, sometimes it is best to hold a low pair, instead of keeping a single high card. Another thing that players should keep in mind is that discarding all of the cards in their hand should be their last resort. The basic rule is that whenever players have a card that can lead to a winning combination, they should always keep it. For instance, three cards that can develop into a Straight, two cards that are consecutive, or any cards of the same rank or suit. The only time that players should replace all of the cards in their hand is when they don’t have any valuable cards. Last but not least, whenever players have a card that contributes to forming a Straight, they should keep it. The reason why, is that the payouts for this winning combinations are very high. However, it is worth mentioning the chances of getting it are not high enough and therefore, in some cases, it is best to keep a pair than to go for a Straight. In addition, players should break a Straight only if they have four cards to Royal Flush. Another important thing that should be taken into account is the difference between an outside Straight and an inside Straight. An outside Straight is “open ended”, meaning that it consists of 4 consecutive cards and it can be completed by a card on either end. For example, a hand that consists of 4, 5, 6, 7 would be considered an outside Straight because it can be completed by either a 3 or an 8. On the other hand, an inside Straight is 4 non-consecutive cards that require an “inside” card in order to be formed. For example, 4, 5, 7, 8 is considered to be an inside Straight, because it requires a 6. Outside Straights are much easier to make and thus, players should aim at getting them more. 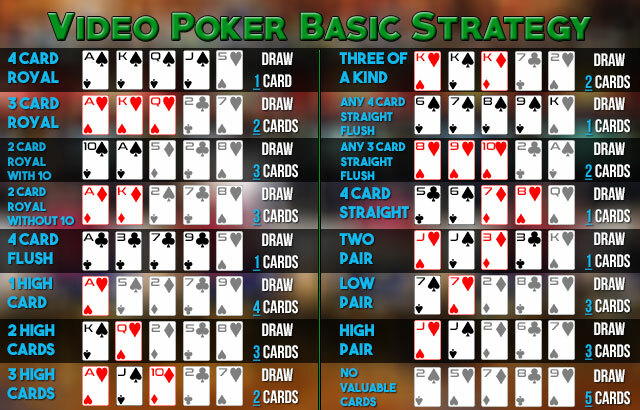 The basic strategy is one of the best strategies that video poker enthusiasts can learn in order to improve their game. Thanks to it, it is possible to successfully gain advantage and make a profit in the long term. It is moderately easy to grasp which makes it suitable for all types of players, regardless of their experience and knowledge. Nowadays, players can find video poker in a number of brick and mortar casinos as well as online which makes it extremely easy to play it on a regular basis and develop their skills. Moreover, a lot of online casinos also offer free play mode, meaning that it is entirely risk-free to enjoy video poker.